Veg Pualo is an Indian style rice pilaf made with long grain basmati rice, an array of vegetables and whole spices. 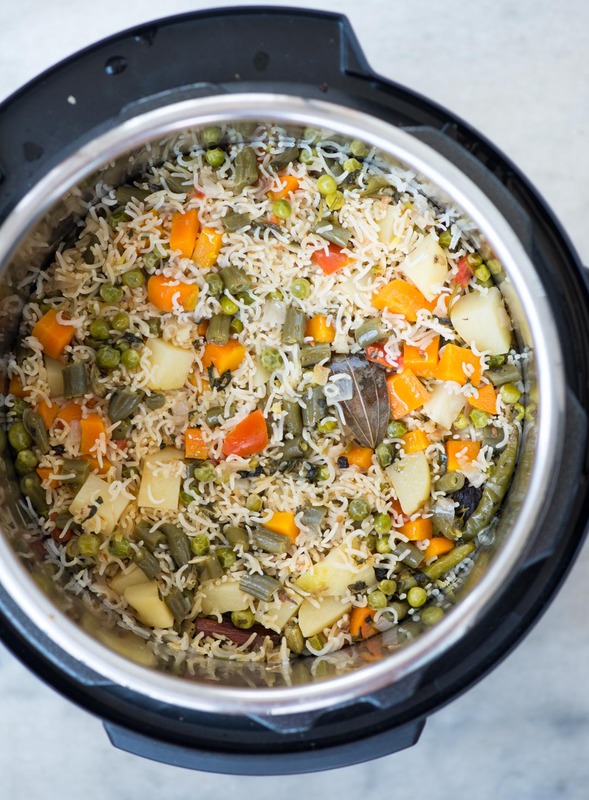 This fragrant one-pot dish can be made on stove top, in a pressure cooker or in an Instant Pot. 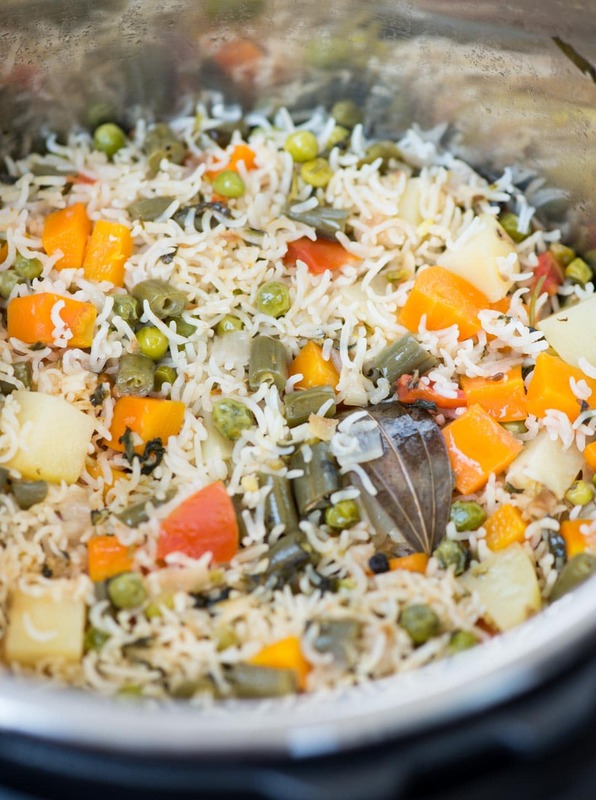 Love Vegetable Pualo with fluffy aromatic basmati rice, tender vegetable? I am gonna share my way of cooking restaurant style Veg pulao, that I have been making for years now. I am also adding a video that would demonstrate to cook pualo in an Instant pot because I love Instant Pot rice. If there is one food that I can eat for the rest of my life, then it is rice. Yes, I love rice for with my life and is on the top of my comfort food list. Be it a bowl of plain white rice with dal and curry or something fancy, I love it every form. I have shared so many recipes in the past that involves rice. CAJUN SHRIMP AND RICE SKILLET, VEGETABLE SHRIMP STIR FRY MEAL PREP, THAI BASIL CHICKEN RICE BOWL etc. 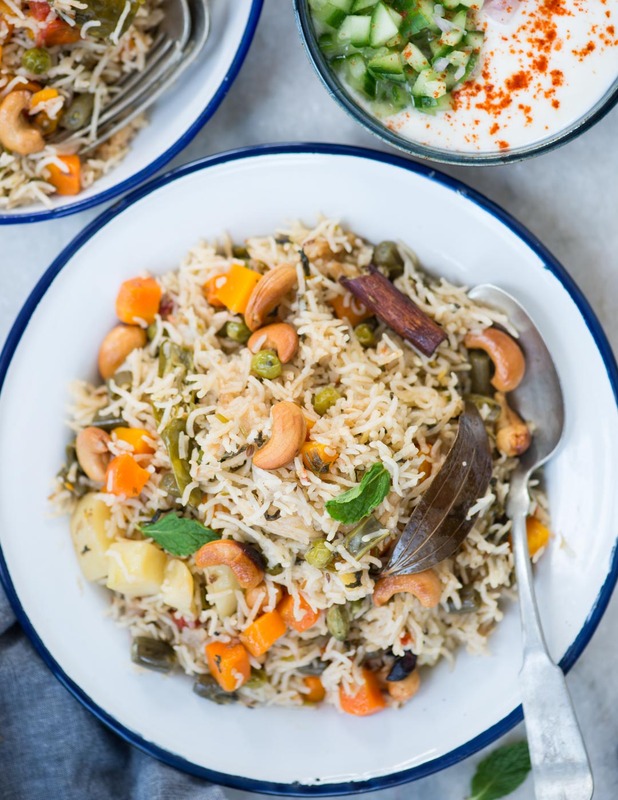 Now let’s talk about this Vegetable Pulao. One of the most common dishes in every Indian household. The recipe might differ from house to house but the ingredients are mostly similar. I remember my mother preparing pulao everytime we expect guests at home. Even during winter Veg pualo used to appear frequently on the table because fresh vegetables were available in abundance. There is not a fixed list of ingredients when it comes to Pulao. You can basically play around and use whatever you have at your disposal. Good quality aged Basmati rice is a must. For a fluffy, separate grain of rice, you must use good quality basmati rice. 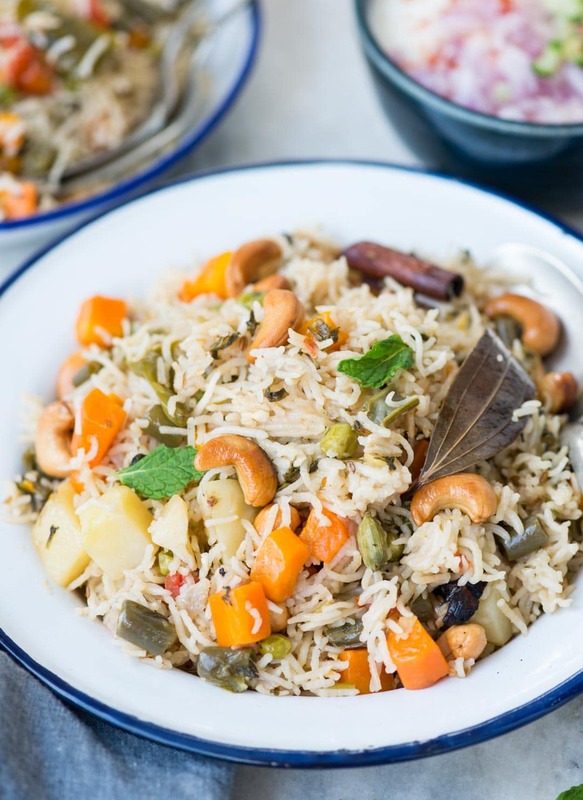 You can also use any other short grain fragrant rice for making Veg pulao. You can add various types of vegetables. Cauliflower, potato, Green Peas, Carrots, Capsicum, Tomatoes, Beetroot, corn etc. Just add whatever vegetables you have in hand but not more than 3-4 veggie. Spices used to a make a Pulao is as per preference. The recipe I am going to share here has only whole spices. I prefer to have subtle flavours and its good serve with curries. But If you want you can also add little garam masala to it for a robust smell. Coriander and mint leave is kind of optional but I really like the extra flavour. You can either use only coriander or skip both. I always make fresh ginger garlic paste in a mortar and pestle for pulao. You can use a grinder as well. 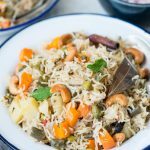 You can cook Veg Pulao in various ways. With different methods of cooking all you have to do is take care of rice to water ratio and the cooking time. Growing up I have seen my Mom makes it either in a vessel or in Indian Pressure cooker depending on the time she has on hand. Below are there main methods of cooking Pulao. ON STOVETOP IN A VESSEL – Make sure the vessel has a tight lid and can be sealed. So that very less steam can escape while cooking. Another thing is the vessel needs to have a heavy bottom because when the rice is almost cooked and all the water has evaporated, heavy bottom pan prevents the rice from burning. IN TRADITIONAL PRESSURE COOKER ON STOVE TOP – Cooking in a pressure cooker is way quicker than the above vessel method. You need to reduce the amount of water. Second thing is to adjust the cooking time so that the rice or veggies doesn’t turn mushy. 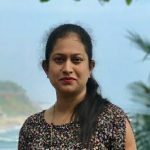 IN INSTANT POT – My new favourite way of cooking rice is in the Instant Pot. I am in love with this cool electric pressure cooker. Take less than 10 minutes to cook the pulao with fluffy, separate grain rice. For a fluffy perfectly separate grain of rice make sure you soak the rice for at least 20 minutes and then drain well. I am sure soak rice is a common practice but draining all the water well is also important. Any extra liquid in the rice might overcook the rice. SO after soaking rice place it in a colander for at least 15 minutes. Roast rice for a couple of minutes along with other vegetables so that it is well coated with ghee/oil. Be careful not to break the grains while roasting. You can also roast rice separately in little ghee and add it back. Add hard vegetables like potatoes to the oil first and cook it for 2-3 minutes then add softer vegetables like green beans, carrot, peas. This makes sure all the vegetables are cooked through. I always prefer adding warm water to the roasted rice and vegetable mixture. It not only reduces the cooking time but also makes the grain fluffy. Soak basmati rice for 20 minutes. Then drain in a colander until all the water is drained. Keep aside. Set Instant Pot to Saute mode. Once hot add oil and ghee. Add all the whole spices and saute for 30 secs until fragrance. Add chopped onion and cook until it has softened and started to brown. Add chopped Potatoes. Cook for 2 minutes string in between. Add crushed ginger and garlic. Cook for 30 seconds. Then add chopped carrot, beans, peas, tomatoes and green chillies (if using). Mix everything well. Add drained rice, chopped coriander and mint leaves. Mix everything well and roast rice for 2 minutes. Keep stirring gently in between to avoid burn but carefully so that the grains don't break. Add warm water. Deglaze the bottom of the pot to loosen any sticky part stuck at the bottom. Add salt and check the seasoning once. Cover the lid and set the IP to Manual/High-Pressure mode. Set the timer to 7 minutes. Once the timer is off, let the pressure release naturally for 10 minutes. Then release remaining presser manually i.e quick release. While serving add some Cashews roasted in Ghee. Follow the process mentioned above until step 7 i.e. roasting the rice and vegetable. Increase the water to 3 cups and add to the vessel. After the water is added, let everything come to a boil. Then reduce the flame to low and tightly cover the vessel with a lid. Cook on very low flame until all the water has evaporated. Then switch off the flame and let it rest covered for at least 15 minutes. Using a slotted spoon or a fork fluff the grains slowly. Follow the process mentioned above until step 7 i.e. roasting the rice and vegetable. Increase the water to 3 cups and add to the Pressure Cooker. Close the lid and after 2 whistles lower the flame and let it cook for another 5 minutes on low flame. Then switch off the flame and let the pressure release naturally. The Rice to water provided here is what I have always used in different ways of cooking. It has always worked for me. The ratio might differ depending on the type of rice used. In Traditional Pulao whole spices are used but if you find it annoying to have whole spices in your food then you can increase the garam masala to 2 teaspoons and skip all whole spices except bay leaf and cinnamon.